Innovation guides the path of this fast-paced world. We are leading to do our job more effectively and steadfastness with the intelligent use of advanced technology. Various Stainless Trashes can have made the same accomplished for us. When our hand touches the sensor zone, the lid of trash opens automatically. Lid goes to the original place after the debris is removed. The 130 degree or applied angle plays the vital role in such opening and closing. Taking closer look at the rate of consumption of power that such trashes consume is a good indication of the usefulness. With the use of 4D batteries, the power consumption is kept at minimum. Fully powered batteries can last up to six months. The operating extent is almost 10,000 times. All the stainless sensor trash has extra-wide opening. It can easily accommodate large and bulky items. The product comes equipped with the most advanced infrared sensor technology. Such an advanced technology helps to open the lid when the person comes within a vicinity of 6 inches. The closing is also automatic when the person leaves the place. The built-in carbon odor filter eliminates and neutralizes all the nasty odors. There is Carbon Filter Gate that acts to maximize odor-absorption capabilities. This is a deodorizer that is eco-friendly and keeps all the harming effects away from the children and pets. At the same time, this deodorizer makes way for making the home with a clean and fresh environment. Such a deodorizer remains effective for at least three months. All the sensor operation is touch free. The construction is normally of stainless steel making way for long lasting. These products are also easy to maintain. a) Warranty: The lid mechanism and sensor used to be vulnerable and tends to be malfunction after few years. So for that you must choose product with min 1+ year and for very expensive one check out for 5+ years of warranty against the product. b) Power Supply: These trash works with both D type of batteries or by AC adapter. 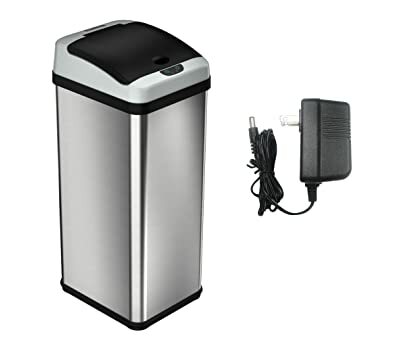 If you choose AC adapter, then you must make sure power socket near the bin and it’s positioning. This can make you free from every-time battery change. But if this can be transferrable then choose with battery and alarm with low battery signal. For set of batteries it normally works for 6 months to 1 year. c) Manual Operation: Always check the functional availability of Manual Operation. In some urgency or in emergency this might be helpful. You might need to open or close the lid manually. Best quality Stainless Steel is used in making this product. 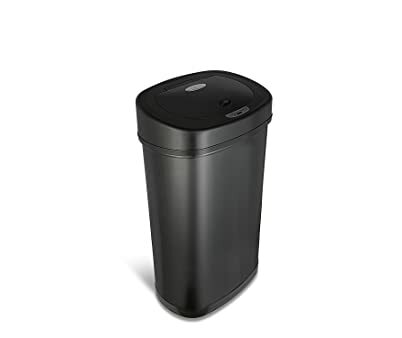 It is a 13 Gallon Touch Free Automatic Sensor Trash Can. The product can be used in the kitchen, bedroom, bathroom and the backyard places. 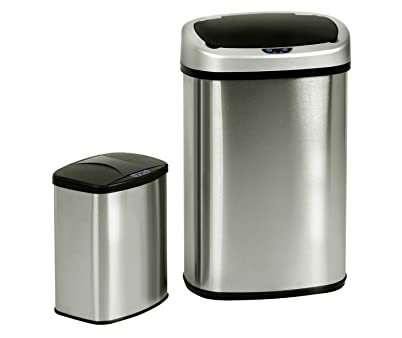 It is popular for having the right properties for trash container. With the superior capacities and sophisticated design, the product has really enabled any kitchen to have an upgraded form. The product has button for open and close functions. There are buttons for switching off and on too. The stainless steel used in the product belongs to anti-fingerprint commercial grade stainless steel. The product is powered with a 4D batteries but that is not included. The product is equipped with a motion sensor adaptor. Absence of any false trigger or unexpected lid closure is assured. The can has an innovative liner pocket store and dispensed liners. Made from brand new and finger print resistant brushed stainless steel. The steel liners rim is flipped for quick change of liners. The code J liners are designed to ensure that they don’t slip and stay completely hidden. An extra thick plastic and double-seam mode of construction is there to prevent rips and tears. Liners are not included to the product. The get up of the product adds to the gorgeousness of the kitchen and bathroom. A definitive add for an automated and healthier home surroundings and environment. The product is 100% free of touch. The sensor-activated operation can lift the lid with just a movement of hand. Extreme convenience and hygiene is also guaranteed. This Can product is known for its sophistication and style. It is made of elegant and smudge-resistant brushed stainless steel. He body is easy to clean and maintain too. The product is a discreet one. But, it can hold lots of trash. This is space-efficient and has large capacity. It has been bestowed with versatility and adaptability. The slim and oval designed product is a perfect fit for Kitchen, Office, Bathroom, store and likewise. The product is viable for its ability to steal odor and eliminating cross-contamination of germs. It is possible with touch-free operation. The sensor is water resistant and infra-red. It has a unique capacity to sense motion from a gap of mini inches. 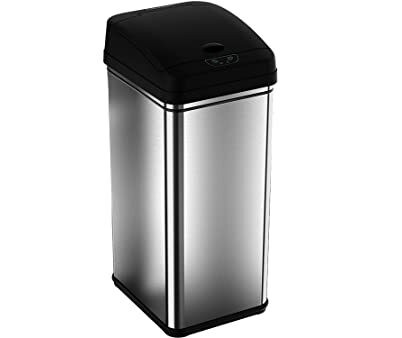 The sides are made of Anti-fingerprint commercial grade stainless steel and snug-fitting black plastic tops. 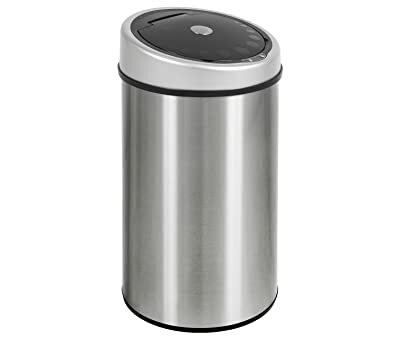 The product has accessories like trash cans of capacity 13 and 2.3 gallon. The former one has no removable container, which is equipped by the latter. The product can be used in home, offices, schools and any care facility. The product can steal odor and even possesses an ability to eliminate cross-contamination of germs. The touch-free operation has been able to make all these plausible. The sensor is water resistant and infra-red. It has a unique capacity to sense motion from a gap of mini inches. The indexed super sized capacity coupled with wide opening makes way for user-friendliness. Sleek design adds to the environment. An induction of energy saving technology helps the battery to sustain a 20% extra life. The product is provided with a non skid base. It is further equipped with inbuilt open and close button that acts with quiet motion. Users are advised to use standard fitted trash bags, or custom fit Nine Star trash bag for using convenience. The product contains an AC adapter for a constant battery free power. The sensor-operated lid opens automatically when the sensor senses the presence. It ensures hygienic capacity. The product has been made of smudge resistant brushed stainless steel. The appearance of the product brings about aesthetics in home. Caressing of this product is also easy. Only wash with soapy water under running tap will serve the purpose. The product is slim and oval in design. Best fir for any kitchen, garage, office and likewise places. The product needs no treatment by hand. The lid of the can is opened automatically by the sense of presence or with the wave of a hand. An AC adapter is provided with the product to enable a constant and battery-free power. 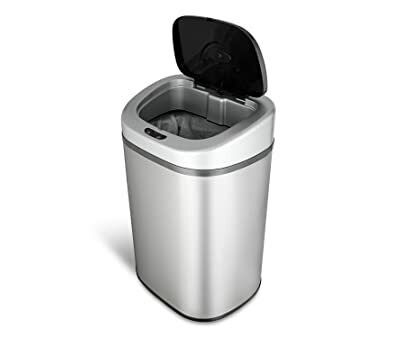 It is also provided with an Odor Filter that works in absorbing stinky trash odors. The product has been made with body of stainless steel and top quality silver colored ABS plastic lid. All the materials are fingerprint proof. It is even easy to clean also. The product is distinguished with the space-saving and versatile design. It is offered with a limited warranty of 1 year. The product is equipped with a motion sensor AC adaptor. Absence of any false trigger or unexpected lid closure is assured. The can has an innovative liner pocket store and dispensed liners. Made from brand new and finger print resistant brushed stainless steel. The steel liners rim is flipped for quick change of liners. The code J liners are designed to ensure that they don’t slip and stay completely hidden. An extra thick plastic and double-seam mode of construction is there to prevent rips and tears. 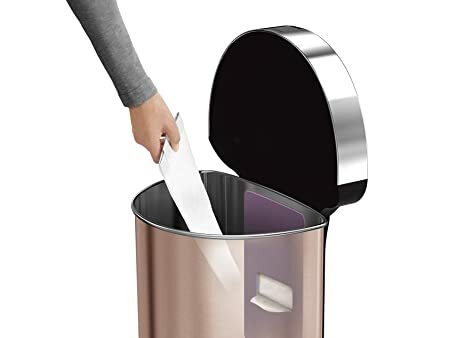 Liners are not included to the product. The get up of the product adds to the gorgeousness of the kitchen and bathroom. The product has been made from T430 version of finger print resistant stainless steel. The presence of Odor Filter seals odor. The product can resist the effect of cross-contamination of germs too. The water resistant infrared motion sensor has a capability to detect motion within inches of its range. Execution of long lasting battery helps to keep battery life extended by 20%. The product is characterized with its non-skid base. Operation is made with open and close button that is equipped with soft close lid. Standard fitted trash bags or custom fit Nine Star trash bags are advised to be used. The use of materials like the T430 version of finger print resistant stainless steel has imparted the product with additional strength. The presence of Odor Filter seals odor. The product can resist the effect of cross-contamination of germs too. The water resistant infrared motion sensor has a capability to detect motion within inches of its range. Execution of long lasting battery helps to keep battery life extended by 20%. A four D sized battery is needed. Operation is made with open and close button that is equipped with soft close lid. Standard fitted trash bags or custom fit Nine Star trash bags are advised to be used. Kitchens, office and schools are the places where this product has mostly been used. This product is characterized with the fundamental total touch-less operating capability. This process is known to be optimum healthy one. 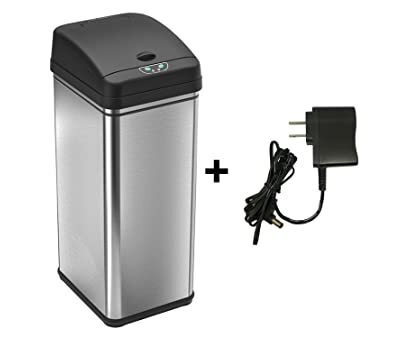 An activated carbon odor filter is inserted that help to eliminate trash odor. Battery free operation is also seduced with the presence of an AC adapter. The opening is additionally wide and large items can also be inserted easily. The brushed stainless steel body helps to impart complements to any decor. The material is smudge-resistant too. All the operations are made with open and close button that is equipped with soft close lid. 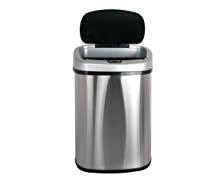 The oval shape and compact size makes the trash can to be laid up at various places. These places include kitchen, office space, schools, dorms and laundry rooms. The use of stainless steel in the body has helped to get increased strength. This can also impart durability. 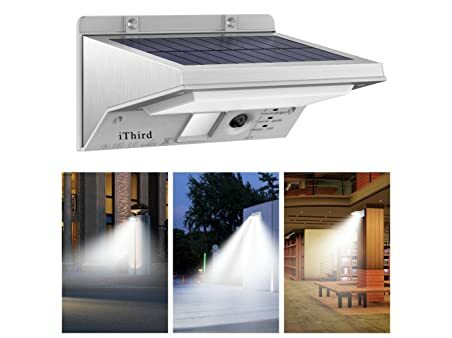 The product is equipped with an advanced sensor technology that makes the product to sense the presence of anything with a range of 10 inches and at 130 degree inclination. A wave of hand is sufficient. 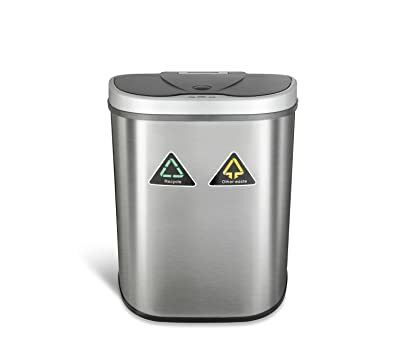 The touch free design helps to reduce germ transfer and it also utilizes in sealing odor inside the bin. 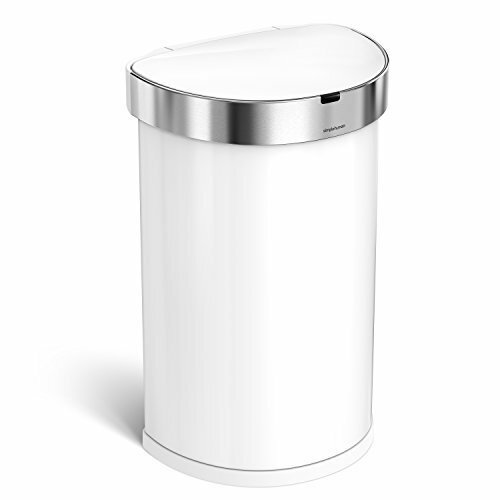 This product is an automatic trash can that is enabled with touch free lid operation. The advanced sensor technology has helped to reduce unintentional lid opening. No operation with hand is the necessity. The presence of powered activated carbon odor filter system eliminates rather absorbs all foul odor of trash. The material used is brushed stainless steel. It is highly efficient in deactivating germ. This material is fingerprint proof and easy process is applied for cleaning. 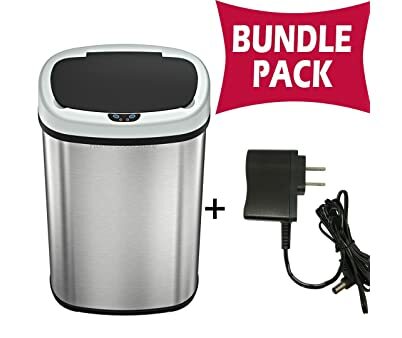 There is a ring that helps to retain all the trash bags within the scope of the trash can. The affluent and beautiful design retreats the need of inner bucket and helps to gain an additional space. 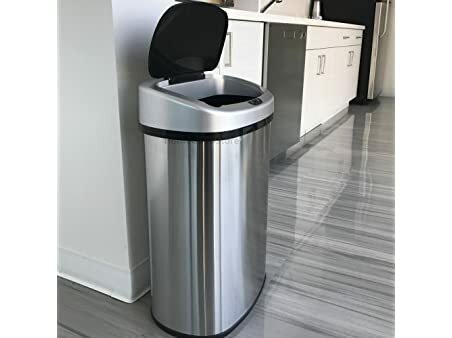 The automatic Sensor trash can are both eco-friendly and user-friendly product, Maintenance and cleaning of these products is not also a tough task. The construction has a stainless steel outline. Therefore, it can easily be taken out and can be washed with soapy water under cold water tap. When such operation is carried out, all the electrical functionaries are to be removed from the base. Thus, the product will be free from any inherent charges and is placid for putting to wash. The vigorous wash will make the product rid of any sticky dirt and a fresh reusable product will be availed again. Use of trash cans is definitely pacing forward towards the world of advanced technology. What we must be convened is all the trash cans must have bridled capacity. The tossing ability of such cans makes the settlement of garbage within the can an easy treatment. This helps to reduce the spreading of foul odor and keeps the environment conducive for health. The sensor ability has made the dealing with the can a more free flown procedure. All the products dealt over appeared standard to me. Only the issue that could affect the decision is the space available with the user and the open space h/she requires.